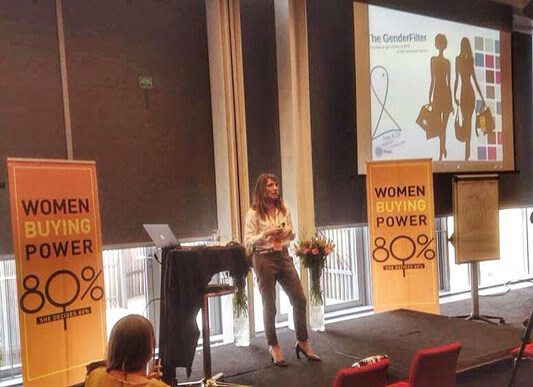 Gemma Cernuda presented The GenderFilter at the 1rst WomenBuyingPower Conference. Copenhaguen gathered almost 100 women&men to understand how to market to women . Freezing for a Spanish and warm for a Sweedish was the beautiful city of Copenhaguen on March the 2nd, when I landed in Denmark. And there were 2 exciting days waiting for me ahead in the city of the little mermaid that also gave some time to go jogging around the beautiful lakes to enjoy its beauty and landscape. It was a 3 day conference with 20 different speakers from Denmark, Sweeden, Netherlands, UK, Germany, France, Spain… That aproach the diffrenet ways brands, services and companies should consider women needs, perspective and values in order to design , communicate, produce and explain their products and services. I was presenting for the first time internationaly the pioneering service called The GenderFilter; that Peix&Co and Ellas deciden have developed to help brands to connect better with both men&women. I exlained the SEVEN FILTERS that every product, service, campaign and brand should pass and succed in order to be successful in the market and be accepted and desired by women and men. The Presentation is here. 12. Female interaction results; provide-make-feel. 27. A woman only gets 25% of what a sales person offers to her. A man gets almost 90%. 34. Dunbar`s Number is the quantity of people you can maintain a network with; and this is 150 people. 37. Instead of telling that your brand is good; do good things; BE good! 38. Images Engage!. Match your headlines with images. 40. Every time you buy a product, you “vote” for something. Ulrika Sobtell. It was a great conference and some of us are already working at a Europan level to creat a Board of experts with a Gender Perspective in order to help brands to engage better with the 80% of the decision makers; WOMEN. Something like a EU femBOARD to assist companies and share cases and insights among us. We’ll be working on that and posting the evolution of this exciting and challenging idea. Have a great week and thank you for giving me some feed-back! https://ellasdeciden.com/wp-content/uploads/2018/11/logo-ellas-deciden17.png 0 0 Gemma Cernuda https://ellasdeciden.com/wp-content/uploads/2018/11/logo-ellas-deciden17.png Gemma Cernuda2014-03-11 13:40:002018-06-26 09:16:04Peix&Co at the WomenBuyingPower-Conference.